Supporting LTE Cat4, it has the top download cellular speeds in major towns. The 4G speed is up to 100Mb/s and up to 10 Mb/s in minor towns (3G), 0.5 Mb/s at major roads (depending on the available network). 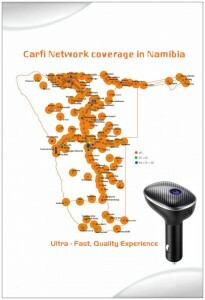 The CarFi can provide Internet to up to 10 Wi-Fi devices at a time. It can also be used as a charger and provide 5V/1A power to a mobile device. The total system consist of the router and an external magnetic foot antenna (7dB) for the best possible radio signal, and consequently throughput speeds.